If WeighMyRack gave out a “Most Improved” award, it would without question go to the CAMP Nano 22. It’s no secret we weren’t fans of the previous version of this carabiner, the Nano 23. But the only thing these two ‘biners share is the Nano name. The new Nano 22 is not only better than the Nano 23 in every respect, it has become one of our favorite carabiners. As the name suggests, the Nano 22 weighs in at a feathery 22 grams. As of this writing (spring 2016), the Nano 22 is the second lightest carabiner on the market (second to Edelrid’s Nineteen G) and 1 of only 9 carabiners under 25 grams. The next closest weight competitors are the 23 gram Metolius FS Mini II and GrandWall Papoose, and the 24 gram Cypher Mydas. To see and compare all of the carabiners on the market and their technical specs, visit http://weighmyrack.com/carabiner. A to-scale shot of many of the rack-pack (5+ colors available) carabiners ordered by weight. Although the Nano 22 is certainly a small carabiner, it is slightly, but noticeably, larger than the other carabiners in its weight class, including the FS Mini II and the Nineteen G. A good objective indicator of this is the differences in gate opening. Where the Nineteen G has a gate opening of 17 mm and the FS Mini II 18 mm, the Nano 22 clocks in at 21 mm. Size comparison: Edelrid Nineteen G (left), CAMP Nano 22 (center), and Metolius FS Mini II (right). This slight increase in size makes a surprisingly big difference in handling and utility. Proof is where the rope goes: the Nano 22 can handle a clove hitch with ropes as fat as 10.2 mm, something unthinkable with most mini-biners. We’ve been using the Nano 22 as a racking carabiner (via the color-coded rack pack) for trad climbing as well as the bolt-side ‘biner on lightweight sport draws. And we’ve experimented using the Nano 22 for both sides of ultralight expandable alpine draws. An even nicer combo (pictured below) is the Nano 22 on the gear end and a Photon wire on the rope end. But despite its small size, the Nano 22 performs admirably in all of those applications. CAMP made sure you can re-rack the alpine draw and fit the Photon through the Nano 22. However, to be fair we must offer this caveat: We have been using and testing mini-carabiners for years now and have become quite accustomed to handling them. I would not recommend them on projects that require clipping when totally gassed. The more pumped you are, the more exaggerated the challenges of clipping mini-carabiners become. And as with all small carabiners, we would not recommend the Nano 22 for use when wearing bulky gloves. In our opinion, the size and weight savings are offset by the time and energy spent fumbling when you have limited dexterity. Is those situations we believe the full-sized 29 g CAMP Photon is the better choice. Nano 22 compared to Photon wire slung on Camalot C4 sling. One of the reasons we disliked the previous version, the Nano 23, was the stiff and inconsistent gate action in conjunction with the smaller gate opening. In comparison, the Nano 22 is a dream. The gate is light but snappy and maintains consistent tension throughout the entire range. The Nano 22 is like a small version of the Photon, only better. It has a slightly stiffer gate which prevents it from cross clipping when racked, a characteristic that plagues the Photon. It’s also stiff enough to mitigate any concerns about it accidentally becoming unclipped when jostling around on your harness. It’s simply a pleasure to operate. Well done, CAMP, well done. The other noticeable difference between the old version and Nano 22 is the width of the gate. Where the old version has a gate that was so wide it could open when rubbing against the rock, the new version reduces the issue with a narrower gate and the slightly shrouded nose. Comparison of carabiner gate and nose design of old Nano 23 (left) and new Nano 22 (right). When you start to look at the details and differences between the previous Nano 23 and improved Nano 22, it becomes pretty clear that CAMP spent a significant amount of time on the new design. We don’t want to poo-poo the 23 too much – it was the lightest carabiner in the world when it was released. But the 22 is so much more refined it’s almost misleading to give them the same name. When the Nano 22 was released in 2015, we really geeked out on the changes and theory of why the 22 should be superior (you can see detailed comparisons of the nose angle and more in that article) and our extensive hands-on experience has confirmed all of our suspicions. Nose design comparison between CAMP Photon wire (left) and Nano 22 (right). The slightly shrouded new nose design also minimizes snagging. It’s not a fully hooded design like the Black Diamond Oz, DMM Alpha Light, or the Wild Country Helium, but the shroud along with the steep nose angle stays clear of gear loops, bolts, and slings – one of the biggest gripes we had with its predecessor. And despite the shrouding on the nose, CAMP has managed to keep the nose narrow enough to fit into tiny chains and old, bent pins. It’s not a feature you’re likely to need often, but when you do it’s indispensable. In contrast, the new FS Mini II has a substantially wider shroud, reducing accidental gate opening but limiting where it can fit. Nose design of the Edelrid Nineteen G (left), CAMP Nano 22 (center), and Metolius FS Mini II (right). The Nano 22 is the only 22 gram carabiner and it’s priced at the low figure of $6.95. If you add a gram of weight, you can get the FS Mini II for $5.95 and GrandWall Papoose for $6.25 (Canadian). These three carabiners are exceptional deals as they are an anomaly, otherwise you can’t find carabiners under $7 until you hit the 30 gram mark. The 3 rope test: A 9.5 mm rope was the largest diameter we found the Nano 22 accepted easily. Sometimes it feels like we see so much new gear that it becomes harder and harder for an individual piece to stand out. But we are truly impressed that CAMP managed to increase the strength of the Nano while simultaneously reducing the weight by a gram and improving the performance so dramatically. CAMP states the Nano 22 is “the lightest fully-functional carabiner on the market with unique attributes that set it apart from other smaller carabiners.” This is one piece of marketing spray we actually have to agree with. If you’re looking to replace existing gear to drop weight at a great price, or if you are building a new trad rack and want to go with lightweight racking ‘biners, or alpine draws, the Nano 22 is an excellent ultralight option. 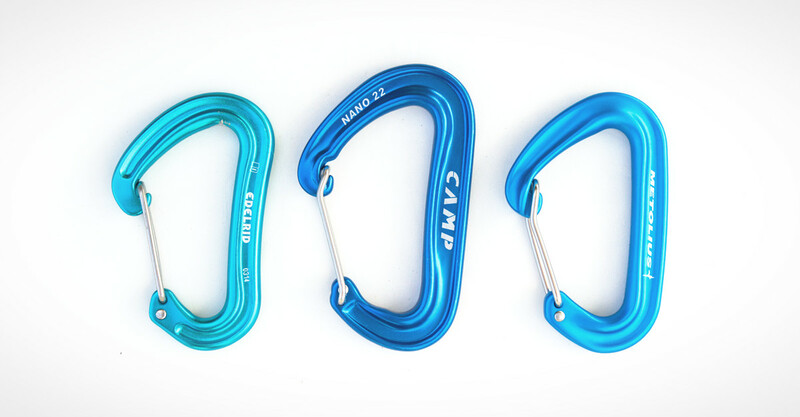 These are the places that we know where you can buy the CAMP Nano 22 carabiner in the US. They are affiliate links, which means we get a small commission if you click a link and buy any product (at no extra cost to you). Your support encourages us to continue to write honest reviews.